There is *still* time to catch up ... if you already haven't picked up the pattern you can get the Girls Sizes HERE or Ladies Sizes HERE ... both patterns are available from Jocole. These sew up SUPER fast and you're gonna love them. Today we're doing Steps 6 through 10. 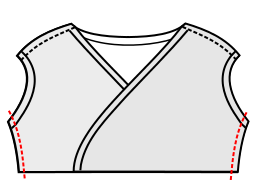 Align the bodice front pieces at the center front mark, BASTE in place 1/4" from edge. Make sure to catch both ends of your binding.